We’re small enough to know you, Large enough to serve you. 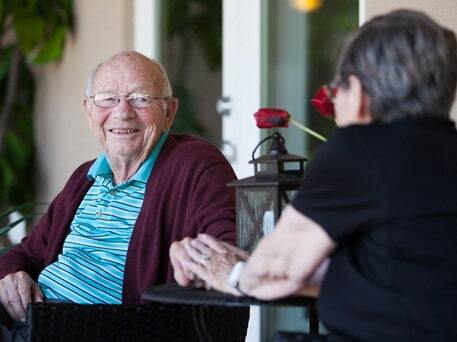 Quality of Life is a priority at Angels Senior Living. It’s the peace of mind that Angels’ gives families that is important to point out. It plays an integral role in what sets us apart. You will have the confidence that your loved one is being cared for in a way that exceeds the needs and expectations. We actively find out needs, wants, and interests of our residents across all of our communities. 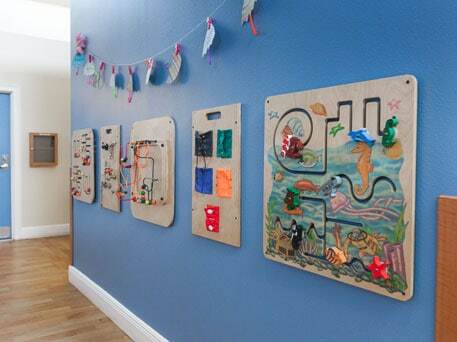 It’s central to how we operate and we’re dedicated to doing everything possible to bring our residents happiness and ultimately, be part of enriching their lives. 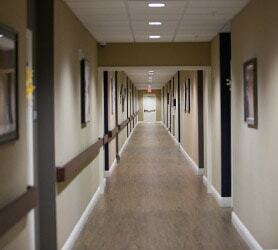 Angels Senior Living has a tailored solution with its secured Memory Care units. Does your loved one have a decline in cognitive abilities, including memory and personal care skills? Have they been diagnosed with a form of dementia such as Alzheimer’s? Is there a need for a significantly higher level of care? Is there an “elopement risk” present? If the answer is yes to any or all of these questions, Angels Senior Living has an ideal solution with its Memory Care secured units. Once the initial assessment as a potential resident has been completed, our Angels team will determine if Memory Care would be the best fit. Memory Care at Angels Senior Living provides personalized care and activities tailored to each resident’s abilities and preferences. With our Memory Care residents, there is a large ability gap so it’s our goal to make the experience as customized as possible. It may be the best choice for your loved one to stay at their residence while being treated for an illness or injury. 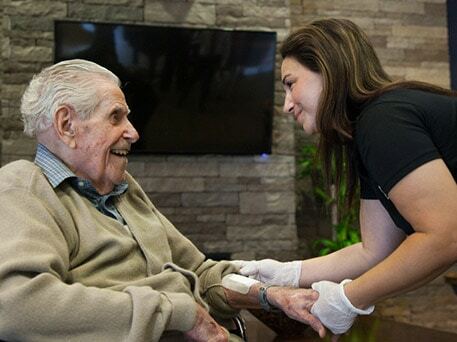 Whether it’s at their private home, Assisted Living community, nursing home, or hospital – Angels Care Home Health is dedicated to serving each senior with personalized quality care and attention. 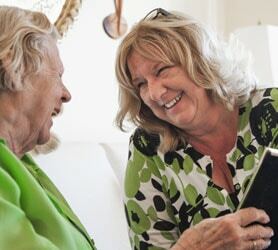 Angels Care Home Health offers Skilled Home Health Care, Private Duty Services (hyperlink to page), and Rehabilitation Services (hyperlink to page), depending on your needs. Support can range from a weekly brief visit to 24-hour care, and everything in between. All the unfamiliar lingo can get confusing for someone looking for a little help and support for themselves or a loved one. Quite simply, Private Duty is “in-home care” that is generally self-pay and customized to the individual for help with everyday tasks or companionship. We know that it’s critical for families to understand the options available during such an emotional journey. We’re here to help you navigate this experience and to be your partner with any questions along the way. "LOVING, CARING, NURTURING, DEDICATED, and COMMITTED... these are the words that come to my mind when I think about Angels Senior Living - "The Lodges of Idlewild." My family feels blessed that we found "The Lodges" for my mother and we know that she is being provided the level of care that unfortunately we can't. Choosing this community was an easy decision for us due to the fact that they provide an endless amount of love, support and care for her..."
"...It is refreshing to visit with my father and our new family knowing that they are always happily available to assist in any way. I have never felt that anyone is too busy to speak with me or to take the proper time to appropriately care for my father. My expectations of The Lodges' staff have been surpassed and I am so thankful for having a new family and friends for us both." "...it was new, clean, and had a warm feeling just like home. The staff has given my mom excellent care, and always treated her with respect. I have had many meals with my Mom at the beautiful dining room and found that the food has always been great... The staff at The Lodges did a wonderful job of communicating with me what their plans were for caring for my mom through the hurricane which was a great relief for me. I want to thank everyone at The Lodges for giving my Mom such great care." "The staff at Angels Senior Living - The Lodges - are all very kind, considerate and, oh, so patient. They always took time with me to explain anything that my mother was going through. They treated my mother with kindness, respect and grace." "...My Uncle receives honest, loving care and friendship. The staff happily radiates compassion and kind hearted assistance. I have complete confidence and peace of mind knowing that my Uncles needs are not only met but are as important to the staff as they are to him. Thank you Angels Senior Living..."
"... It was easily the best decision we could have made. My mother enjoyed her time there and felt welcomed from the first day. 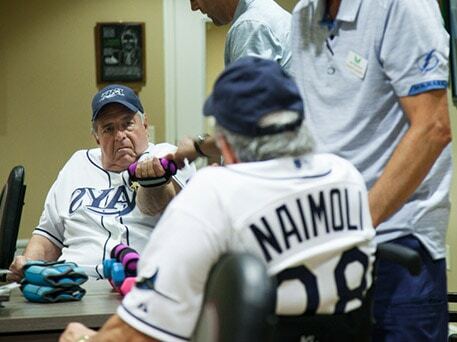 Not only do they provide superior care for their residents, they also provide amazing support for the families. I lived out of state and could not always be there for every special event and holiday. However the staff always made my mother feel like a part of their family and kept me involved with photos, texts, emails and even phone calls. The care and compassion exhibited by the entire staff was unparalleled..."
"My mother is 96 years old and has Alzheimer’s. The memory care building is beautiful. It is bright, cheery and well maintained. 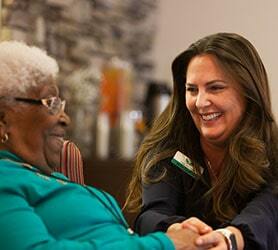 The caregivers are professional, kind, and show respect to all of the residents." "...Communication with my Mother’s immediate caregivers is best described as attentive, professional, and compassionate. Some of her caregivers have over 30 years’ experience in dementia care (this experience is very important to me). On the first day we moved Mom in, the recreational staff interacted with my mother immediately, trying to get to know her, so that she would feel more at home. The recreational staff have so many activities scheduled on a daily and weekly basis that no one should ever be bored or lonely." "We chose Angels Senior Living, The Lodges at Idlewild, because of the atmosphere both in physical setting and the personality of the caring and attentive leadership, administrative, activity, dietary and nursing staff. Since being here we have found their staff presence to be reliable and consistent in how they care for our loved one. They guided us thru all the steps in this life transition to an Assisted Living setting for our father." "...We have found the Staff to be caring and the Meals and Dining have been Top Notch! Little by little Mom has begun to look forward to Activities provided. The Leadership Team has been Great, always available to listen and learn about Mom’s needs and offer ways to help." 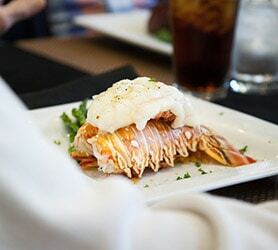 "...I guess to sum it up, after a brief adjustment period, my father has made good friends, enjoys delicious meals, gets to play in his combo at happy hour and is loved and well cared for by every member of the staff. He now calls his beautiful cozy apartment home. My sister and I call these wonderful people our "Angels on earth." 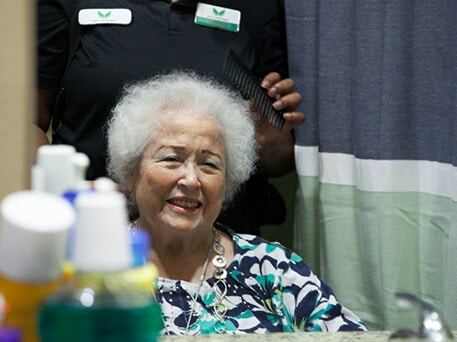 Assisted living has been around for decades, and we have been in the industry since 1978. Our current management and owners have been involved since 1994, and two decades later the management is still actively involved in day to day operations. The mission of Angels Senior Living is to provide exceptional healthcare and customer service for every resident, family member, and visitor. We are honored every day to have the opportunity to serve your loved ones and look forward to discussing your individual needs and how we can best serve them. Our goal is to provide the same care, comfort, and respect that we would give our own family members. All residents and their families are considered part of our extended family. Our top tier management team as well as our team members take pride in knowing each resident’s unique needs and desires in order to serve them with excellent care and hospitality. Since we are locally owned and professionally managed, we are able to ensure a personalized experience for you and your loved one. It is our mission to make every resident truly feel at home. It’s in the interactions that happen daily, that is what sets us apart from the rest through creating and maintaining personal relationships with residents and families. Food warms the soul and Angels Senior Living has dedicated time & resources to ensure high-quality, freshly made food for all residents to enjoy. We have a variety of community options for you! Our Angels Continuum of Care is unique…whether it’s Assisted Living, Home Health, Private Duty...we have you covered!